Space Race is a trilogy of generative 3d stochastic visual environments, which develop simulations that evolve over time, endlessly, exploring infinite random conditions, inspired in the quest for space. keywords: stochastic generative endless space race game simulation 3d flocks It consists of three videoprojections, two are autonomous, one is interactive with a joystick on a plynth. Each module is independent of the other, and can be shown individually or the three all together as a tryptich, which is prefered. Space Race #1 is a self-sufficient 3d simulation where teams of autonomous agents compete for green fuel that allows the spaceship, the only way of escaping, to take them to another planet, the next level of the game. Space Race #2 is an abstract game where the user is invited to play alone, using a joystick, to fight his way through hostile planets populated with autonomous agents that seek that take his ship. 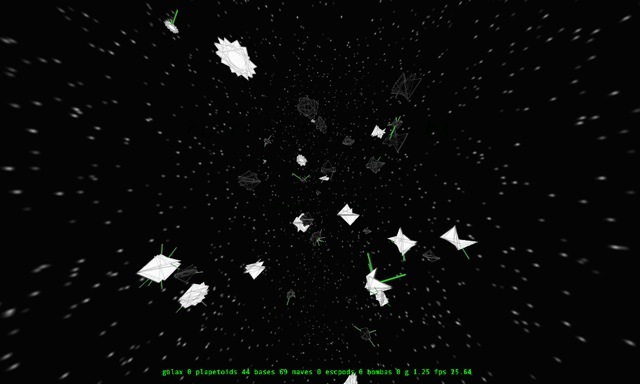 Space Race #3 is a self-sufficient 3d simulation observed from the point of view of each galaxy, where the ships are launched into space from the planetoids and move according to the gravitational fields. André Sier is an artist-programmer. Degree in Philosophy, studied also Painting and Sculpture. Makes objects that seek to unravel connections in time and space using algorithmic structures. Highlights series ‘struct’, ‘747’, ‘Space Race’, works proposing emersing experiences in abstract spaces, often using site-specific data from microphones and cameras, or synthesizing experiences with generative and chaotic maths. Has exhibited code and installations in Portugal, Spain, USA, Italy, Germany.